When you are thinking diamonds you should be thinking Ciprian Jewellers. We can guide you along the somewhat difficult path of choosing the best diamond to suit you and ensure you are getting the very best diamond at the right price. Diamond quality is assessed using the '4Cs' which are Carat Weight, Colour, Clarity and Cut. All of these factors combined affect the pricing of a diamond. The carat weighing system used for diamonds starts at about 0.005ct for the smallest cut stones and goes up from there to as big as you can imagine. The bigger the diamond the rarer it is in nature and a 1.00ct diamond is worth much more than four 0.25ct diamonds. A brilliantly white diamond in the D-G range of the colour scale not only look impressive they are also rarer in nature and again demand a premium over stones further along this colour scale. A colourless diamond has the least amount of chemical imperfections in it's make up leaving it with no colour and finding something like that in nature is difficult. Not all diamonds are in the white scale of colour, we can source for you natural coloured diamonds in shades of pink, intense yellow, champagne yellow, deep rich browns, black and even a rare blue if they are the colours you desire. Clarity. Nearly all diamonds have small imperfections and again the less imperfections or inclusions the rarer the stone. Most inclusions are not visible to the naked eye without the aid of magnification unless the stone is from the very bottom end of the clarity scale. The cut is what gives the diamond brilliance and can be the defining factor in bringing all of the above together into a beautiful bright stone that really catches the eye. A diamond if cut perfectly will refract almost all of the light back out that enters it giving off the brilliance and eye catching sparkle that everyone desires. I believe there is a 5th C that a lot of retailers leave out and that is Certification. We try to source all of our large stones of 0.30ct and above with a Gem institute of America (GIA) certificate with laser inscription to give you the piece of mind that the stone has been lab graded and you are getting what you pay for. These beautiful diamonds are tracked from the mine all through the sorting, cutting, grading processes and are laser inscribed to ensure you are receiving a stone from the prestigious Argyle mine in our rugged Kimberley region. We always have these stones on hand for you to view. 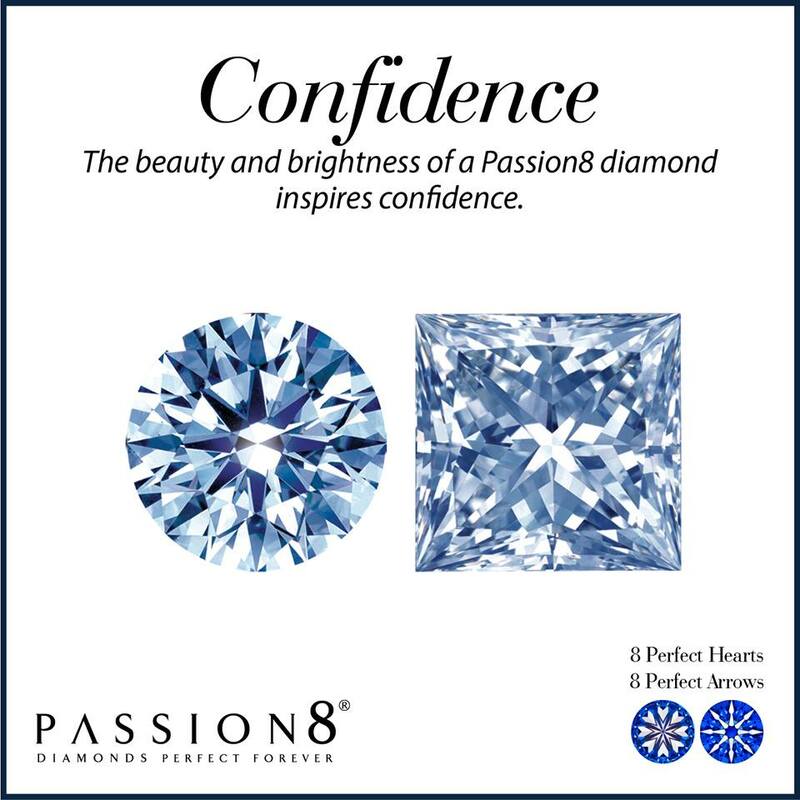 Less than 1% of the worlds diamonds are of a high enough standard to become a PASSION8 Diamond. Once hand selected, the rough stones are expertly cut to exact and perfect mathematical proportions by some of the worlds most qualified diamond cutters and polishers. The result however is breathtaking. Each one of the 58 facets is cut to perfect mathematical proportions, revealing 8 perfect hearts and 8 perfect arrows within the stone. This ensures light refracting through the diamond only comes out the top surface, creating an extraordinary sparkle.